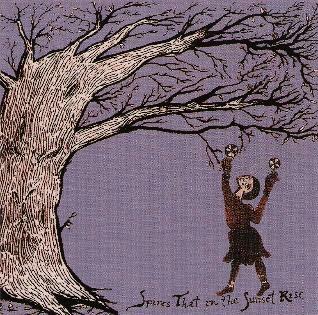 Spires That In the Sunset Rise - "s/t" / The Traveling Bell - "Scatter Ways"
What a strange and unsettling sound Spires That In the Sunset Rise produce. Like the sound of MacBeth's three brooding witches, or perhaps what music by harpies would sound like if the harpies of ancient Greek myth had made music. The Chicago trio blends guitar, cello, rattle shaker, bells, hand percussion, autoharp, harmonium and sound effects both natural and perhaps supernatural into a bizarre, twitchy, creaking, sometimes screeching sound, full of chants, unearthly moans, and shrieks. I'll have to admit, this is fascinating, but not easy music to listen to. Their sound seems inspired in part by the weirder side of that obscure but somewhat rediscovered early 70's folk band Comus. But unlike Comus, who would also veer off into territory more haunting and beautiful, Spires That In the Sunset Rise stay straight on their course through the dissonant, chilly night winds in dark forestlands of the weirdly strange. It's not that they are not capable of more beautiful sounds. Member Kathleen Baird, on her solo album reviewed below, conjures up startling moments of haunting beauty in her music. Spires just chooses to follow a darker, weirder path and to not stray from it. There is indeed, a kind of strange beauty to it, like the lure of something dark and evil. But its relentlessness makes it a little difficult to listen to the entire album straight through. Now if this all sounds like I didn't like the album that would be the wrong conclusion to draw. This album mesmerized me. Spires That In the Sunset Rise are true originals. I just think I might have enjoyed it as a whole a little more with more variety in their sound. But a few tracks at a time, these are potent, spooky, and quite gripping songs. 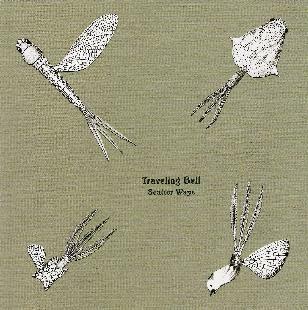 One of the members of Spires, Kathleen Baird, recording under the name The Traveling Bell, finds, perhaps a slightly better balance, and an easier (but certainly not lazy) sound with her lovely solo album Scatter Ways. Baird takes a generally more melodic approach to her own music, but the odd touches of dissonance still creep in here and there. Acoustic guitar playing is sprinkled with soft drones, distant bells, jangling, shaking percussion, wind instruments, and various brushstrokes of organic sound, along with Baird's vocals. Far from having the airy kind of voice of the typical female singer/songwriter, Baird's voice is expressive and unusual, and she's not afraid to utilize her singing to create strange sounds, though she doesn't do that as much on this album as in the group context with Spires. She also throws in a few evocative, instrumental cuts on the album. It all amounts to music that is rich with color and mystery. It's a different kind of mystery than her work with Spires. The kind of mystery on Scattered Ways is the kind of mystery like, just what is in that old closet upstairs in the farmhouse that hasn't been opened in years? Open it up, and through the soft shadows, you may just shed some dust mote filled, pale golden sunlight on some of the secrets in the music of The Traveling Bell. It's that kind of mystery. For more information on Spires That In The Sunset Rise, visit the Graveface Records at their web site: http://www.graveface.com. Email at: mail@graveface.com or tarpet408@hotmail.com. The band also has a couple of their own web sites that, at the time of writing this review at least, seemed somewhat unfinished, but both are worth a look: http://www.geocities.com/spires_that_in_the_sunset_rise and http://www.spiresthatinthesunsetrise.com. For more information on Traveling Bell, visit the Secret Eye web site at: http://www.secreteye.org.